It’s no secret that donuts are the dessert du jour. From the classic cinnamon rings to the more exotic fried fancies, we just can’t say no to the dough. 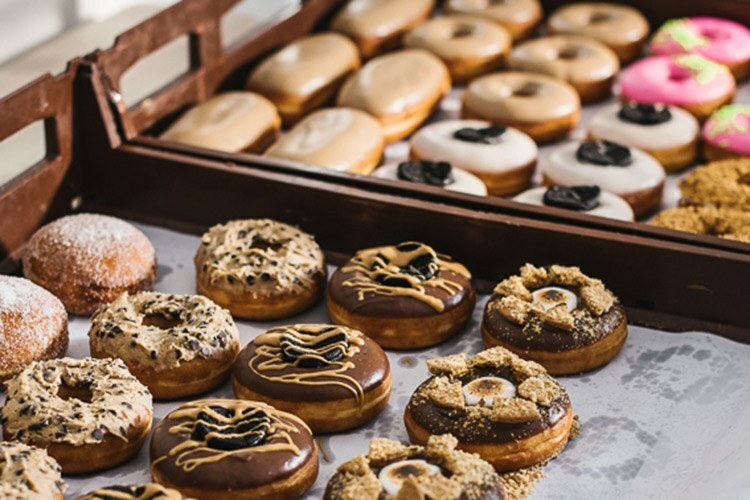 Some of Sydney’s best are made by Grumpy Donuts – but if you’ve never been able to get your hands on one of their sweet sensations (we feel your pain), we’ve got news you donut want to miss. They’ve just opened a store in Camperdown. Yes, that’s Grumpy Donuts IRL. OMG. Grumpy Donuts has amassed a loyal following from their online store and delivery system, and it’s not hard to see why. With flavours like buttered toast, s’mores, and dark choc mint, there’s a hole lot to love. 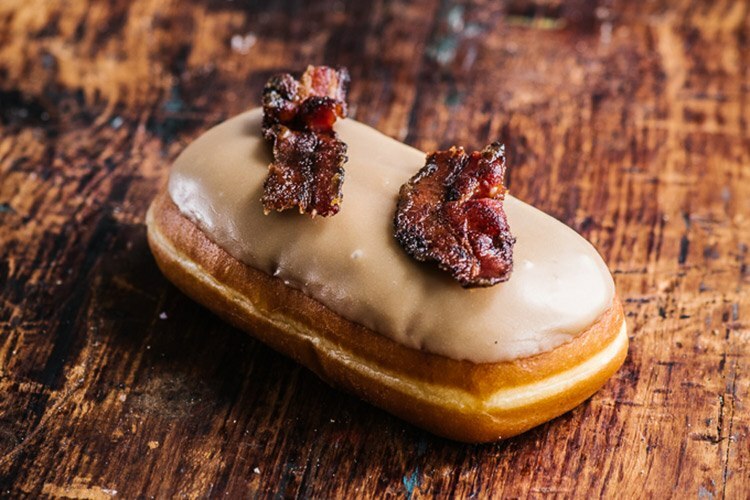 Plus there’s their famous Maple Bacon Bar, which features maple syrup and brown sugar icing, and candied streaky bacon bits. Just looking at is like glazing into the face of god. All of these varieties are available in their bricks and mortar store, along with exclusive weekly specials. There’s also a barista serving coffee, which you might just need after the sugar crash sets in. Still, it’ll be worth it – every flavour sounds all-round amazing to us! We sat down for a donut (or a dozen) with Grumpy Donuts co-owner Elise to find out more. Hi Elise, thanks for chatting to us. Can you tell us a bit about your background and how you ended up at Grumpy Donuts? Scott and I (the owners of Grumpy Donuts) started the business two years ago on a whim to spend more time with each other and fill the Sydney donut void that existed at the time! Neither of us are pastry chefs or business moguls, we just worked for about a year before we started the business on a great recipe and a fun brand and found our way to this point through a lot of dedication, sacrifice, passion and hard work! What made you decide to open a permanent store, and how has it changed your production process? The shopfront was our goal from day one! Our online business was essentially just a means of getting off the ground with zero dollars to do so! I think it’s such a wonderful thing to have a place that our customers can visit, enjoy a great coffee and buy a donut exactly at the time you’d like one! Rather than our old model, where our customers needed to order weeks in advance to enjoy our product! I think this method is exactly the way donuts were intended to be consumed, with some friendly conversation and a hot cup of coffee! 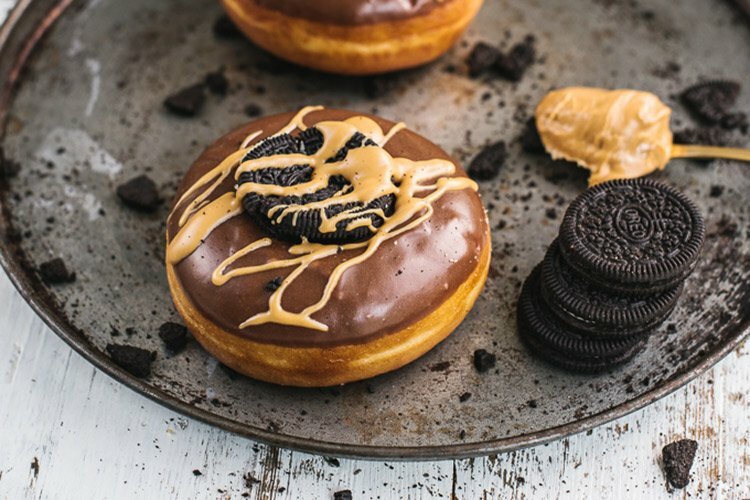 Who’s up for Choc Orero Peanut Butter Donut? Your donuts are available in some really unique varieties like buttered toast, sour patch jam and maple bacon. Where do you find inspiration for your flavour combinations? I have to credit Scott for most of the crazy flavour combos! He’s definitely the creative side of this partnership. We do draw inspiration from everywhere though – we’re just both such huge fans of food that we know what we enjoy and love experimenting with new things. What goes into making the perfect donut? Very early mornings, a lot of concentration and a dedication to perfection. It’s not easy by any means and we’re still improving on everything we do each day! If Homer Simpson stopped by Grumpy Donuts, which flavour do you think he’d choose? I think he’d have to get one of everything, surely! Why do most donuts have holes in the middle, and what happens to the dough from the centre? I believe historically that the middle was punched out to allow for quick and even cooking time. We use the centres to make our delicious little bite-sized cinnamon donut holes! When you’re in the mood for a great non-donut-related meal, where do you like to go in your area? We absolutely love supporting our fellow Inner West small business, Mister Gee Burger Truck. After a long day of cooking sweet treats, the only thing we want is something salty and delicious like a burger, and we are obsessed with Gee’s creations! 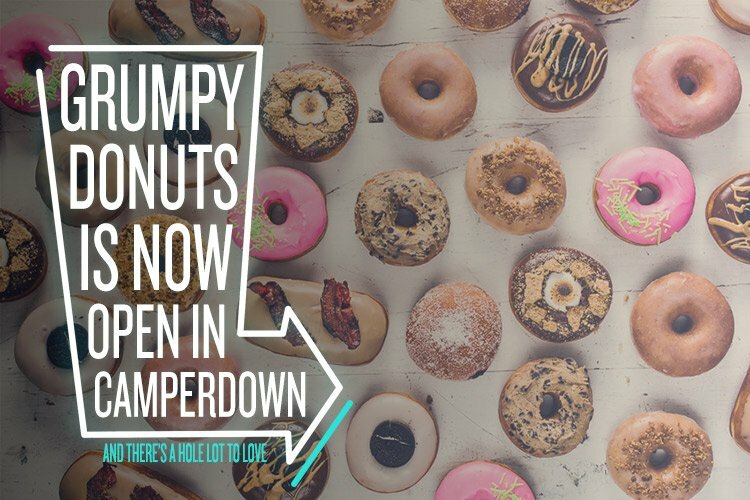 You can visit Grumpy Donuts at their store at 72 Pyrmont Bridge Rd, Camperdown. For more information, you can visit their website or their Facebook page.